Background: the authors review the different definitions that have been proposed, policy developments, availability and uptake. 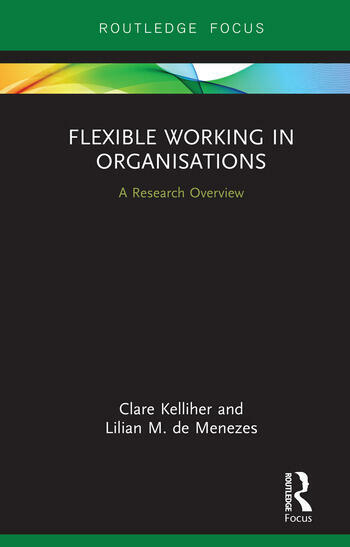 Outcomes from flexible working: the main chapters focus on the outcomes for employers (e.g. performance, employee retention, organisational commitment etc. ), as well as for individual employees (e.g. well-being, job satisfaction etc.). Evaluation of extant knowledge: the authors comment on the existing literature and consider the methodological approaches adopted in the literature. Conclusion: suggestions for future research are proposed. Of interest to students, academics and policy-makers, this book provides an expert overview of the empirical evidence and offers critical commentary on the state of knowledge in the field of flexible working and new forms of work. Clare Kelliher is Professor of Work and Organisation, at Cranfield School of Management, Cranfield University. She has a long-standing interest in flexible working and has published widely in this field, including recent articles in Human Relations, Human Resource Management and Human Resource Management Journal. Lilian M. de Menezes is Professor of Decision Sciences, Cass Business School, City, University of London. Her research focuses on work and organisations, energy markets, and developing methodology. Lilian’s publications include articles in Human Relations, Human Resource Management, Industrial Relations, and Journal of Operations Management.